Team Singapore proves that she is not just A Little Red Dot in the World of Subbuteo Table Football! 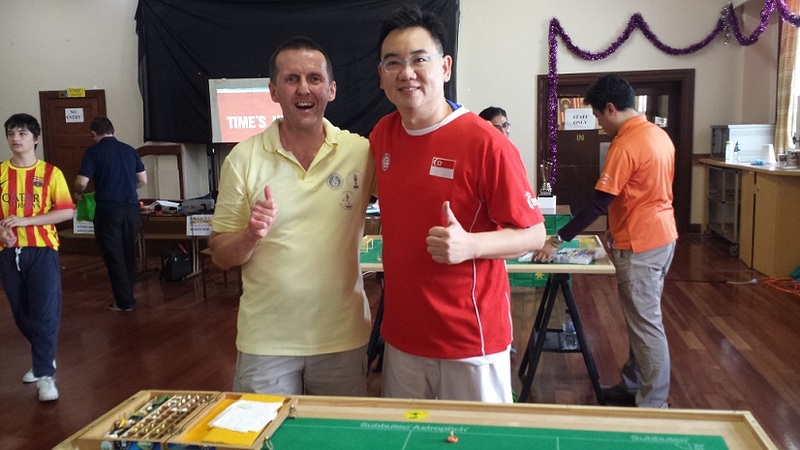 The weekend of 17th & 18th of January 2015 turned out to be an eventful weekend for Singapore Subbuteo, proving that it was one of the power houses of Asian Table Football by leaving her mark on the inaugural Australian Grand Prix and Asian Cup of Table Football. The weekend began with the warm-up matches and the draw of the event which was on the eve of the tournament, on 16 January. 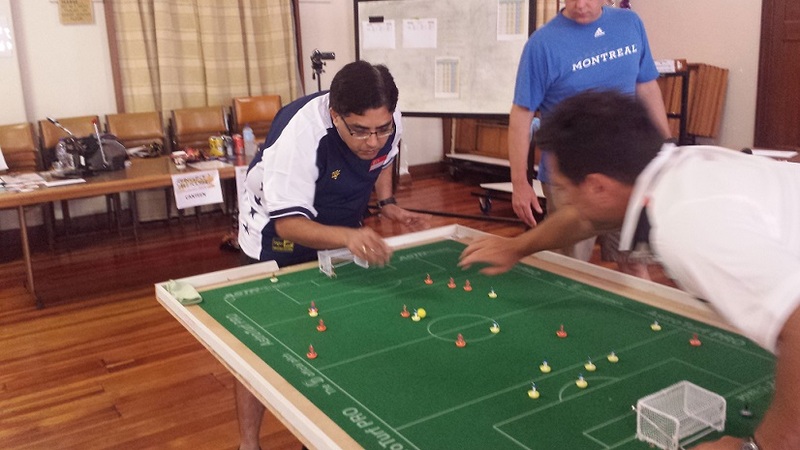 A total of 24 players registered for the Open event, which included 3 from Singapore, namely John Ho, Bernard Lim and Vikas Chandiramani, and 1 from Hong Kong, Antonio Carabillo (of Italian decent), who plays his competitive Subbuteo in the Singapore Premier League. Despite being overwhelmed by the 20 Australian participants, Team Singapore overcame the odds with some brilliant displays. The Open event started bright and early on Saturday morning. Top-seed John Ho topped Group 1 with victories over Daniel Lomabrdi and veteran players Steve Dettre and Paul Mercer, to book his place in the quarter-finals. 2nd seed Antonio devastated his opponents in Group 2 by scoring a total of 23 goals without conceding to top the group and book his place in the quarter-finals. Antonio was ready to prove that Hong Kong would be no pushovers despite fielding only 1 representative. In Group 3, Vikas Chandiramani was drawn against 3rd seed Peter Thomas who had recently participated in the World Cup in Rochefort. Despite losing to Peter, Vikas managed to scrape through to the barrage round on goal difference with a victory over Dillion Izon and a draw with Raffaelle Lombardi. The tournament’s 5th seed Bernard Lim, with the experience of the World Cup behind him, convincingly topped the group winning all 3 games by scoring a total of 18 goals while maintaining a clean sheet. This meant that all the Singapore based players had made it past the 1st round! John Ho and Antonio qualified directly into the Quarter-finals as they were the 1st & 2nd seeds respectively, while Vikas and Bernard had to maneuver through the tricky Barrage knock-out round to book their places in the quarter-finals. Both players raised their game with Bernard comfortably defeating Jonathan Ball by 4 goals while Vikas put up a convincing display against young Harry Wightman by hammering 9 goals past him. All 4 Singapore–based players had booked their places in the quarter-finals. A great achievement indeed! The quarter-finals were exciting affairs with end-to-end action. Veteran player Vikas created the first upset of the tournament by beating top-seed and fellow Singaporean John Ho 4-2 in a high scoring quarter-final. This guaranteed Singapore a place in the semi-finals. The 2nd semi-final saw the battle of two players with World Cup experience. Sadly one of them would not make it through. Bernard faced veteran Robert Green who regularly played his competitive Table Football in the tough European leagues. Despite a gallant display, Bernard succumbed to a 1-0 defeat at the hands of Robert. In the 3rd quarter-final Peter Thomas comfortably defeated Eliot Kennedy 4-0 to book his place in the semi-final. In the 4th quarter-final, Antonio defeated Steve Dettre 2-0 to ensure that Hong Kong was also represented in the semi-finals. The first semi-final saw 2nd seed Antonio from Hong Kong facing off against the 3rd seed Australian Peter Thomas. Antonio gave Peter an early scare when he had the first shot at goal which cannoned off the cross-bar. However, Peter with home-ground advantage, kept his cool to overcome Antonio by 3 goals to book his place in the final. Unseeded Singaporean Vikas faced the 4th seed, European-based Aussie Robert Green in the 2nd semi-final. In the first half, Vikas had to face relentless pressure and put up a gallant display denying Robert with his stout defending to ensure that the game went into half-time even. In the 2nd half, Vikas raised his game to create several chances but could not get the all important goal. The game looked headed for extra-time until Robert scored the winner in the last minute to make it an all Australian final. The final was a very tight all-Australian affair with Peter Thomas from Melbourne facing Robert Green from Sydney. Peter proved he was the better player on that day winning the title with a solitary goal. 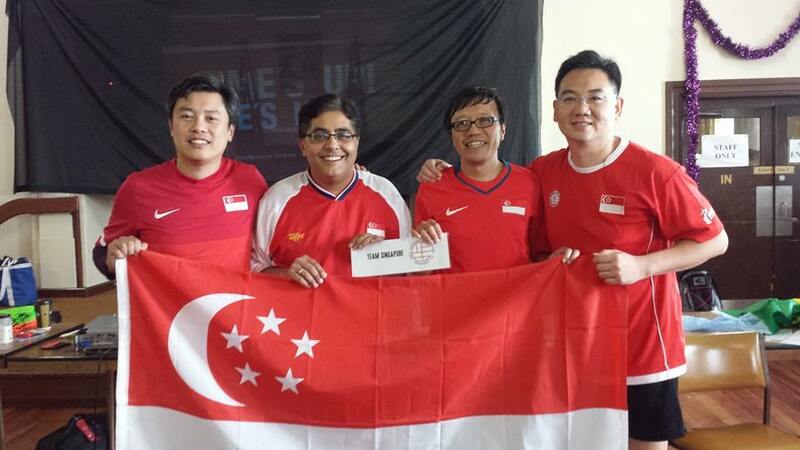 Although none of the Singaporeans made into the final, it was a gallant effort by Team Singapore. We proved that we could mix it with the best of Asia and look forward to 2016 when Singapore will host the 2nd Asian Cup of Table Football. The highlight of the 2nd day was the Club Team event and the Australia vs Singapore International Friendly. As this was an official FISTF Grand Prix event, it included a Club Team Event. As all the Singaporean based players were from different clubs, we were not allowed to participate in the team event under FITSF guidelines. However, our Australian hosts were gracious enough to allow us to play as the Singapore Premier League Selection but we were not allowed to progress pass the group stage. 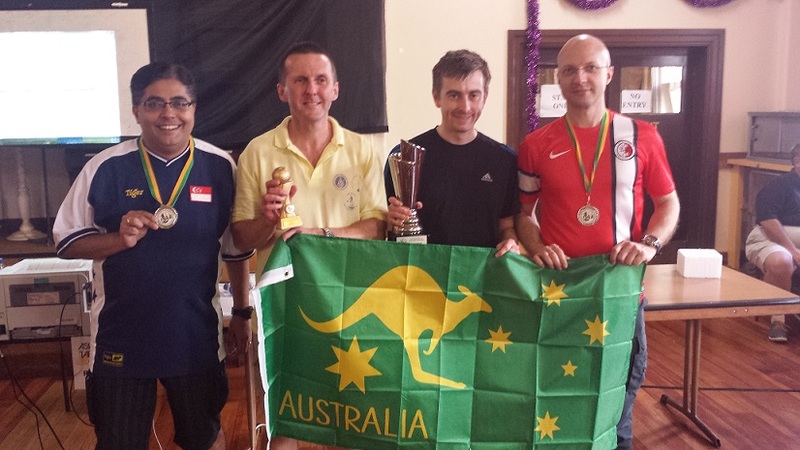 A total of 6 teams took part, including Northern Falcons Team A & B from Sydney, Melbourne Table Football Club Team A & B and Sydney Parramatta. The Singapore Premier League Selection played very well beating Northern Falcons B 4-0 and Melbourne Table Football Club 2-1 to top the group, but sadly could not progress further in accordance to FISTF rules. 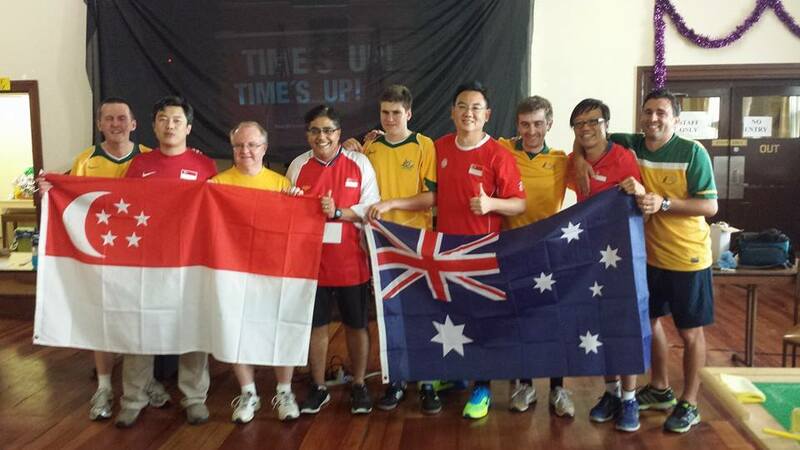 The Asian Cup of Table Football culminated with the FISTF-sanctioned International Friendly between Australia and Singapore, the only 2 nations who had a full complement of players. This was the first international match between these 2 countries. 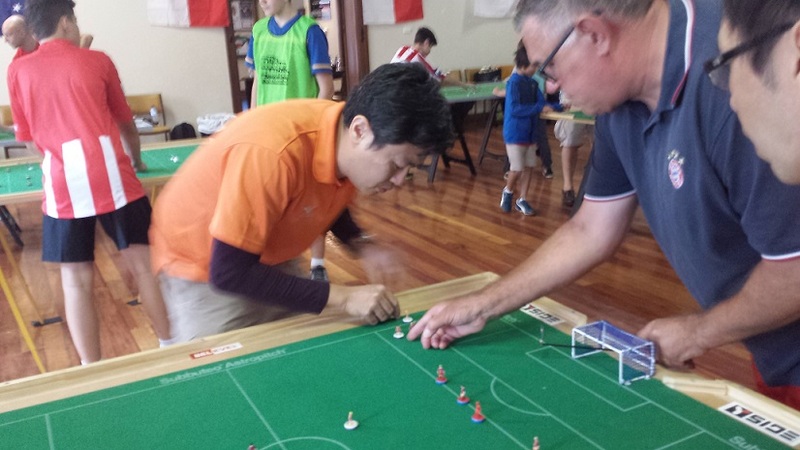 In addition to John Ho, Bernard Lim and Vikas Chandiramani, the wild card for the Singapore national team was Benny Ng, a Singaporean who is an Australian PR currently residing and working in Melbourne and playing Subbuteo with the Melbourne Table Football Club. Australia drew first blood when Peter took the lead against Bernard. Subsequently, Raffaele took the lead against Benny and Eliot also took the lead against John. At that stage, all look lost for Singapore as Australia was leading 3-0. Peter then increased his lead against Bernard by scoring a 2nd goal. At half-time it looked as if Singapore was doomed and Australia would be victorious. However, this proved to be a match of 2 halves. Raffaele was substituted by Benji Batten at half-time. Little did everyone knew that it would prove to be a turning point. Soon after that Singapore started their brilliant fight back. John equalized against Eliot while Benny also equalized against Benji. With Vikas still holding Robert, Singapore managed to reduce the deficit to 1-0. Benny then took the lead 2-1 against Benji. That meant the match was tied at 1-1. However, Australia had a better goal difference and would have still ended up victorious if things has stayed that way. But it was not meant to be for the home team. John then took the lead against Eliot for Singapore lead the match for the first time at 2-1. Robert, sensing that he needed to beat Vikas for Australia to stand a chance, started to pile on the pressure but Vikas was doing a good job holding on. Peter then turned up the heat against Bernard adding a third goal with the hope to improve their goal difference in the event that the game was tied. He was hoping for one of his teammates to get the all-important goal that would turn the tie in Australia’s favour. As the matches entered its final few minutes, both teams tried to raise their game to secure the tie. 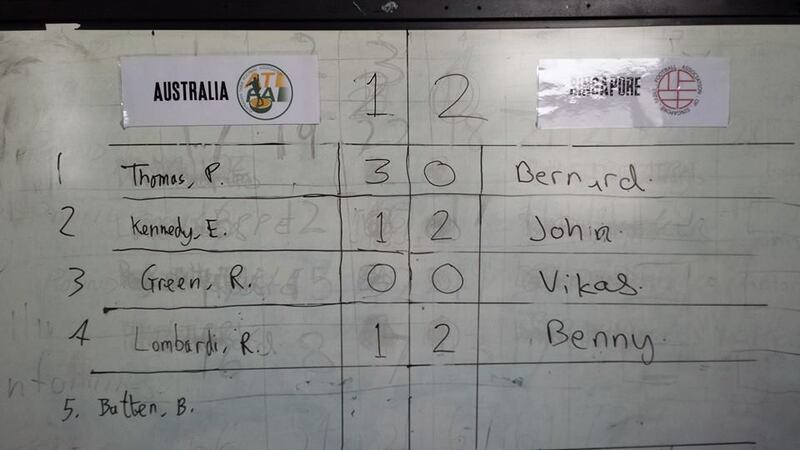 Bernard tried hard to fight back in an attempt to reduce the goal difference, while both Benji and Elliot tried to find the equalizer for Australia. Vikas was still holding Robert to a 0-0 draw. At this stage, Singapore was still 2-1 up and tried her best to hold on despite relentless pressure from the Aussies who had the backing of the home crowd support. As the final whistle blew, Team Singapore jumped for joy as they had thought they had won the tie, but not realizing that the game between John and Eliot was still playing due to some stoppages. Eliot piled on the pressure in the dying seconds knowing that if he scored, he would secure a draw which would give Australia victory on goal difference. Eliot had a shot at goal right at the death which turned out to be the final shot of the match but John saved brilliantly. The final whistle blew and Team Singapore celebrated with a victory dance as Singapore became the unofficial Champions of Asian Table Football! Team Singapore’s brilliant fight-back was against all odds and on foreign soil. A great achievement for its first International victory and what a way to mark the start of the SG50 celebrations!